Pho is a Vietnamese noodle soup and is traditionally made with beef or chicken – Pho bo or Pho ga. It’s usually made with beef bone broth, then warm spices of star anise, fennel, cinnamon or clove. 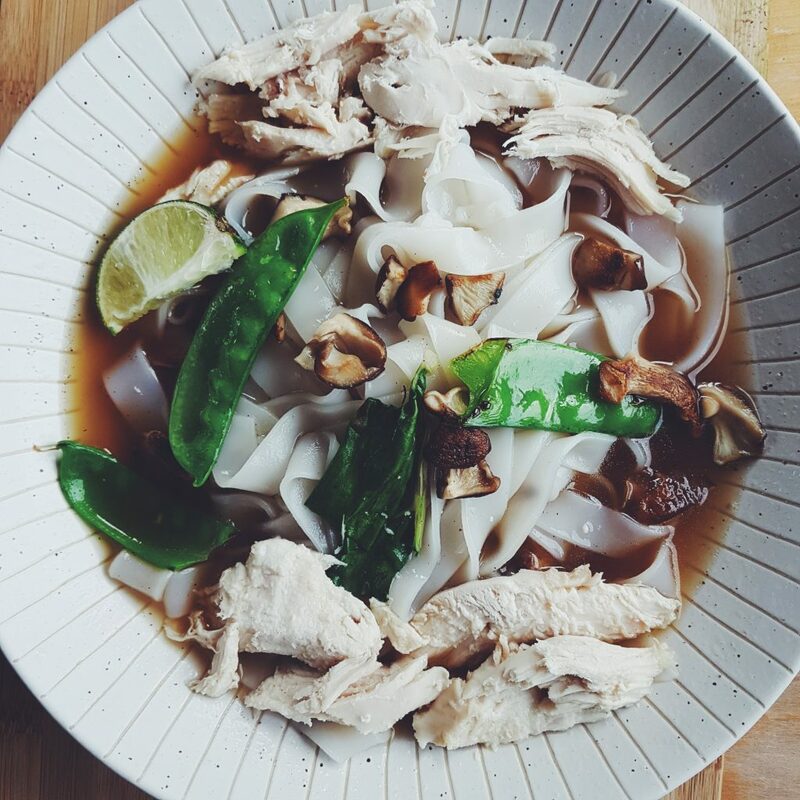 Rice noodles are added with slithers of chicken or beef, then topped with coriander or basil leaves and a good squeeze of lime, a pinch of sugar and some fish sauce. 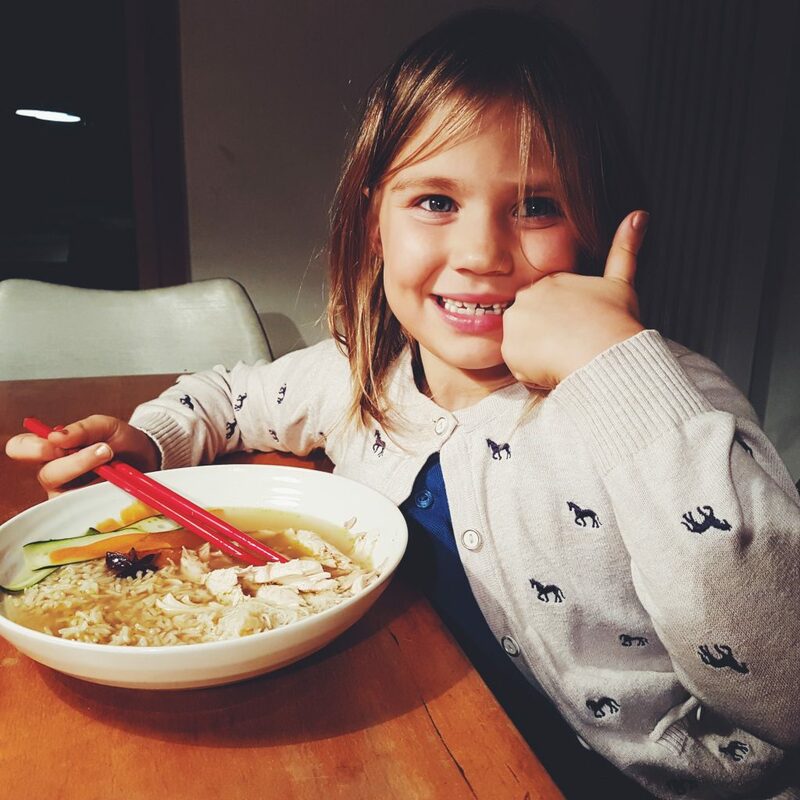 It’s base is bone broth which has a host of health benefits, it feels so nourishing when we eat or drink it, and I know I’m giving my kids an amazing boost of minerals they may not get otherwise. 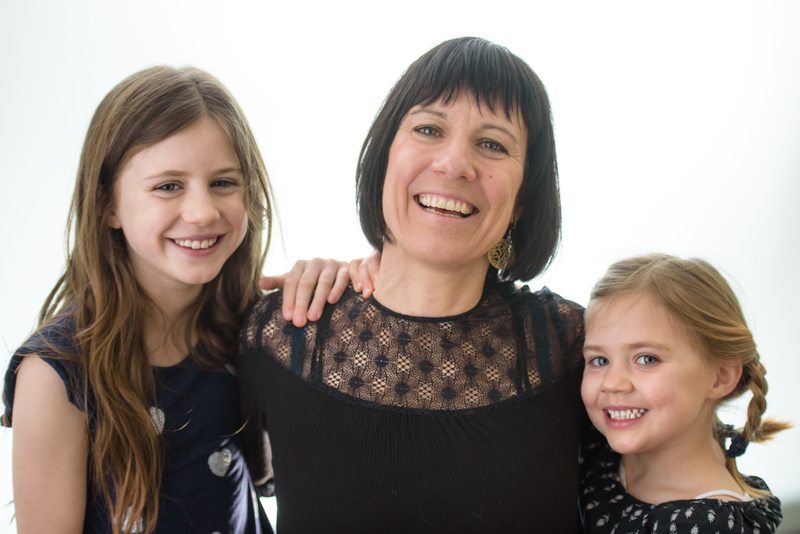 To the Pho, we add a handful of vegetables depending on what we have in the fridge – from slithers of raw carrots and courgette to a handful of bean sprouts, mangetout or green beans. We also add a load of chicken, but you can add prawns or slithers of beef. 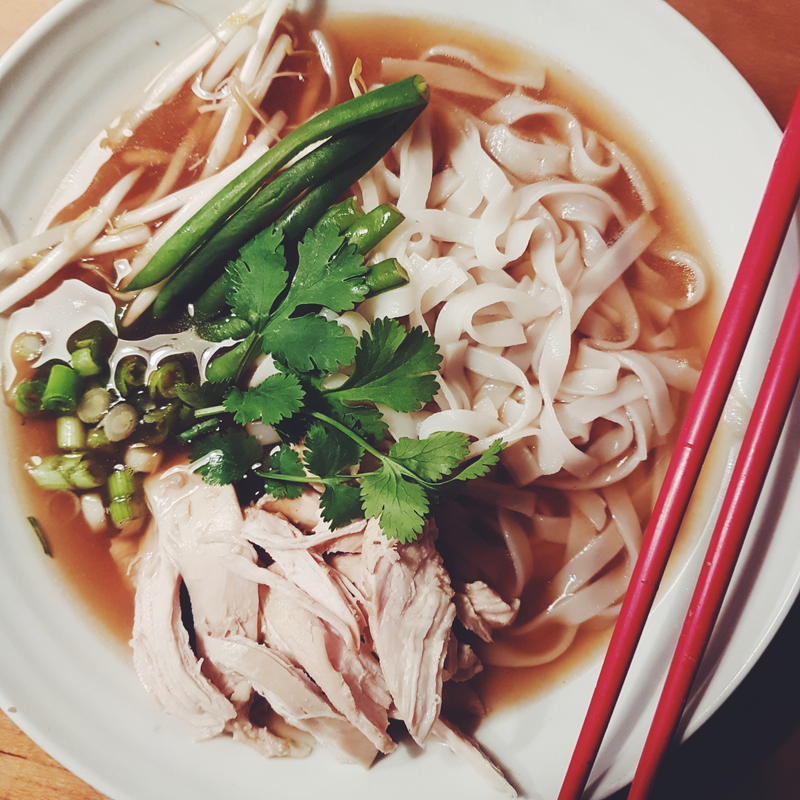 I often make Pho the day after a Sunday roast and from making bone broth from the leftover bones. It’s a great way of using up the leftover chicken pieces which has a lovely flavour roasted and infused with lemon and herbs . Pho Soup is so easy to make, trust me! 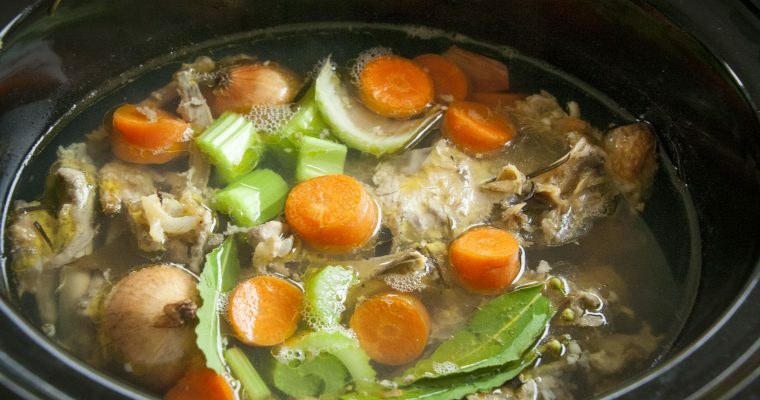 Make the bone broth a good 24 hours before – ideally add a beef or pork bone to the chicken. The mix and the depth of flavour of beef works particularly well in a Pho. To make bone broth please see my last post. If you’re not able to make your own you can buy some from here, or find a local butcher or deli that stocks broth or fresh stock. When you are ready to make it, gently fry a few cloves of garlic and some scallions or shallots in some butter or oil. Then add to a heavy bottomed pan along with the spices. I use star anise, cloves, a cinnamon stick, a few slithers of ginger some coriander seeds, cloves and black pepper seeds. 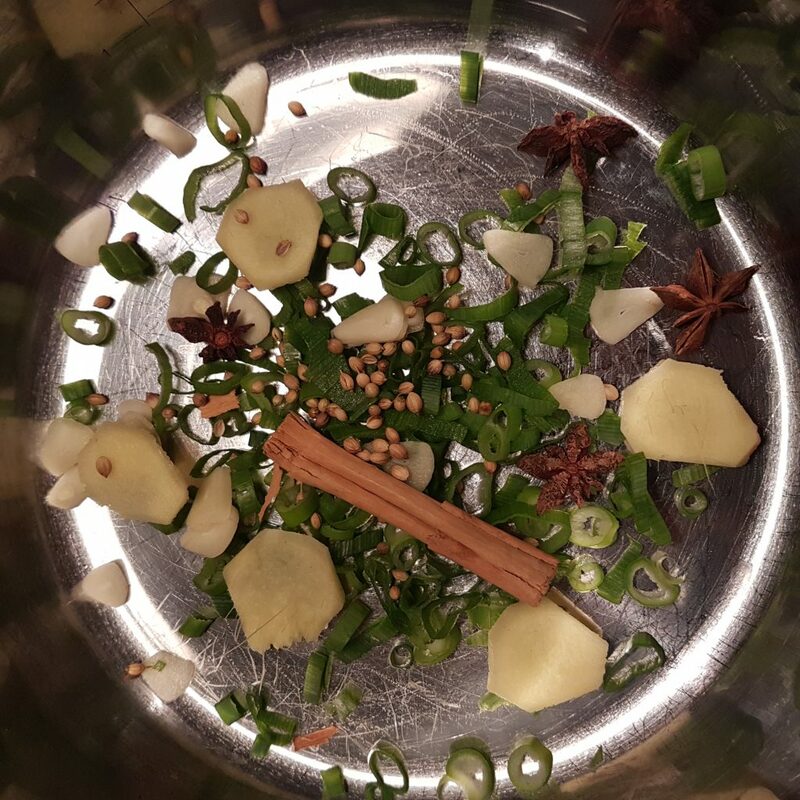 The star anise gives out an incredible smell and flavour that is reminiscent of traditional Pho soup, so don’t miss out on this bit – run to the shop now and buy some or ask a neighbour if they have any. You can add your own combination of spices, many recipes also include lemongrass and fennel seed. Add the bone broth (about 1.5 to 2 litres for a family of 4) and let simmer over a medium to low heat for at least 10 minutes to let the spices infuse into the bone broth and add pinch of salt and the fish sauce. Meanwhilst gather and prep the other additions to the soup. I nearly always use chicken from a roast the day before as it needs to be used up and also has a delicious flavour. But you may want to cook some chicken breasts from scratch. In which case now is a great time to do that. 2 chicken breasts for 4 is fine. You can boil it in the soup, then take it out and tear it up into slithers. Thinly slice the vegetables with a peeler to create slithers, chop some spring onions or scallions and roughly chop some coriander or cilantro leaves. I often do all this bit earlier in the day and then keep in the fridge. Then when it’s dinner for the kids, which is always a rush at any time, I literally heat it up and put everything together which takes only 5 mins making it a super quick and unstressful dinner to serve up. Once you are ready to serve, now is the time to cook the rice noodles. Put them in a saucepan with plenty of boiling water for about 5 mins. Depending on the thinness of them, you may want more or less. Just be careful not to over cook. Our favourites are both vermicelli rice noodles and thicker ribbon ones. You don’t want to cook for too long as they will go mushy, so test them at regular intervals. When they are cooked, drain them and serve them up immediately along side the other ingredients. To serve add a couple of ladles of soup per bowl, then gently add in the rice noodles, and carefully add the chicken, veg and herbs keeping them all separate and so they float on the top. 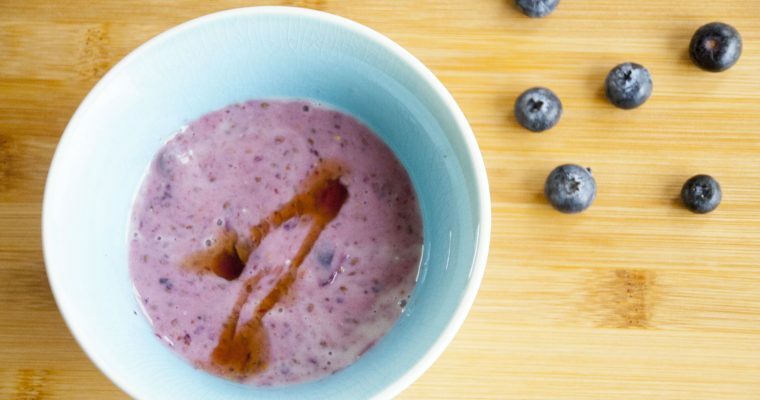 You can add chilli flakes, soya sauce (gluten free) or more fish sauce to flavour to your taste . Step 1 Heat the oil in a small frying pan on medium heat and gently cook the shallots and garlic until caramelised and lightly brown, do not burn or they will be too bitter. Step 2 In a large heavy based saucepan, add the caramelised shallots and garlic, ginger, star anise, cinnamon stick, cloves, coriander seeds, peppercorns, fish sauce and top with the broth. Step 3 If you are using fresh chicken breasts rather than leftovers, then now is a good time to put it in the pot. Step 4 Cover with a lid and bring to a very gentle simmer for about 15 mins. Step 5 Prep the rest of the ingredients – chop the coriander and gather the vegetables, thinly slice the mushrooms. Step 6 Once the chicken is cooked remove from the pot, let cool slightly and shred. Step 7 Meanwhile, cook the noodles, following pack instructions, until just cooked through (do not over-cook). Rinse under cold water to prevent them sticking together. Drain and divide between serving bowls. Step 8 Strain the soup through a sieve. Discard the spices. Step 9 Return soup to the pot and bring to a boil. Season to taste with more fish sauce if needed. Step 10 To serve, ladle piping hot soup into bowls. Step 11 Then carefully add the noodles and chicken shreds on top. Step 12 Add the vegetables and top with the fresh coriander. Step 13 Serve with a lime wedge to squeeze over, and more fish sauce, soya sauce (gluten free) and chilli to taste.